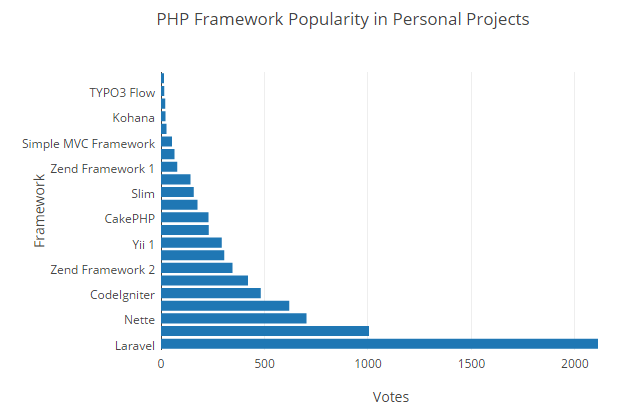 In 2016, Laravel is by far the most popular PHP framework. This list will help you decide which custom PHP framework to deploy. There are so many PHP frameworks, with almost all of them encompassing incredible features. PHP has gained widespread recognition and has become the world’s most versatile server-side scripting language. It is a dynamic and easy-to-learn language which is extensively used for web development. PHP frameworks are widely known as functional platforms and help in creating a complex application easily and quickly. Many PHP developers choose PHP frameworks since they constitute a brilliant platform for app coding and provide a precise structure and environment to develop your project in a speedy manner. Utilizing frameworks is also an unrivaled web development practice which helps to increase scalability and to build top quality web pages. There has been a clear trend in web development over the last few years. Laravel is a clear winner and the trend continues for 2016 as well. More and more of our development logic is shifting to the frontend, while the backend is only treated as an API. However, we think that learning a full stack framework is still important. But with so many frameworks to choose from, how do you decide what’s best for you? Sit back and let me help you find your PHP framework. I have listed some of the top trending PHP frameworks for 2016 which help to execute your PHP project promptly and with least possible effort, which in turn increases your productivity. The above chart shows the increasing popularity of Laravel. Let’s talk a bit more about these frameworks and why Laravel, which was built just a few years ago, is the most used framework today. As the Google search trend chart shows, Laravel is the most popular PHP framework among PHP developers. It is a rather new but great web application framework with expressive, neat syntax that aims to make web development easy and swift. Laravel accomplishes this by simplifying common tasks used in the majority of web projects, such as routing, authentication, sessions, queuing, and caching. The second most popular web framework among PHP developers is CodeIgniter. It is a lightweight, dynamic PHP framework that provides a simple and refined platform to create full-featured web applications. One of the biggest reasons it ranks only as second is that CodeIgniter does not prioritize security. A purely object-oriented based framework which uses DRY (Don’t Repeat Yourself) coding concept, which then helps you with a pretty neat and logical code base. It is unified with jQuery and comes with a set of AJAX-enabled features which use an easy to implement skinning and theming mechanism. All in all, a great choice for someone who comes from a frontend background. CakePHP is also popular among PHP developers because it is lightweight, simple, responsive and requires less coding. It is easy to learn with fast and flexible templating. The built-in “CRUD” feature, which is very handy for database interaction is also one of the most sought-after features. The framework also has numerous built-in features for security, email, session, cookie and request handling. The biggest drawback of CakePHP is the lack of its object-oriented implementation. Symfony is one of the most stable PHP frameworks used by PHP developers for developing websites and web applications. It is a flexible, scalable and powerful PHP framework. It has plenty of reusable PHP ingredients that can be used like Security, Templating, Translation, Validator, Form Config and much more. These are the five trending PHP frameworks in 2016. They have really bridged PHP development gaps and should be accepted by professional PHP development companies to deliver world-class products. But, if I was asked to choose any of the aforementioned frameworks, I would go for Laravel. It is really easy to use and has all the features that people actually use. The documentation for beginners is pretty comprehensive. Just by looking at the code, you can easily understand the entire framework. Whether you’re an experienced programmer or someone who has just started programming, you’ll love it. Want to test how it works? You have the chance to run a test environment on Cloudways via the FREE trial we are offering. You can test any framework you wish to, by launching the custom PHP stack. This post was written by Ahmed Khan, the PHP Community Manager at Cloudways, a hosting company that specializes in optimized PHP cloud hosting services. 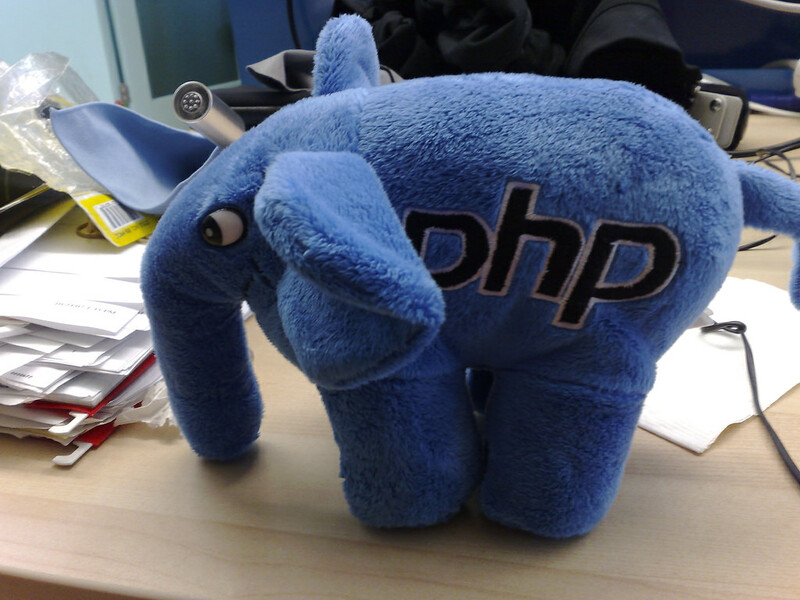 He writes about PHP, MySQL and covers different tips and tricks related to PHP. He is currently active on Cloudways and other blogs. When he is not writing about PHP, he likes watching The Flash, Game Of Thrones and is a die-hard fan of DC Comics. You can follow him on Twitter or connect with him on Facebook.